PROUD TO BE NUMBER 1! Over the last three months the market has been extremely busy with property sales at HOME which is bucking the nationwide trend that has been reported this week. It has been on various blogs and websites that mortgage lending this year is approximately 20% down against the same time in 2014. Thankfully not the case at HOME. In fact not only have we maintained our ‘leading agent’ status, our market share has actually increased again! 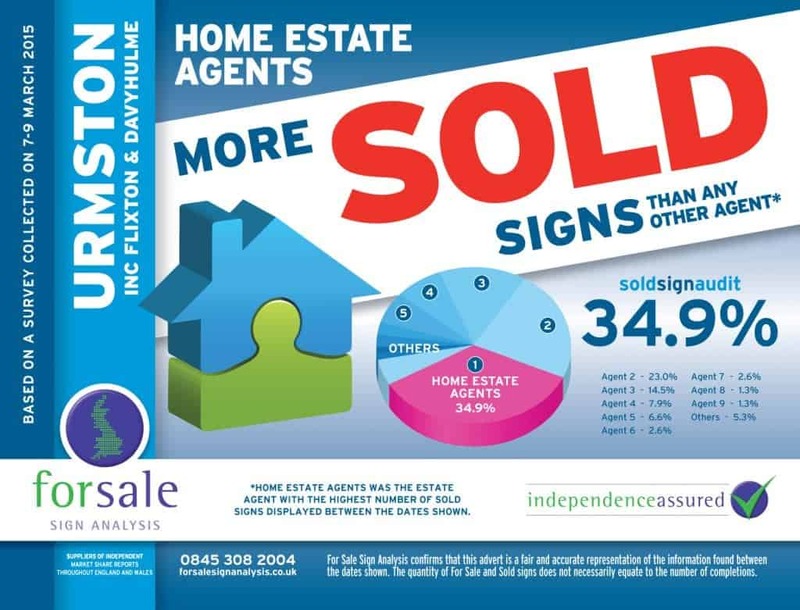 Independently verified by the For Sale Sign Analysis Group we have increased our share of SOLD signs up across the area to 34.9% where as our nearest competitors have fallen back slightly. We are not going to rest on our laurels and become content with where we are currently. We are always striving to offer the best possible service, maintain our well regarded name and continue to offer honest advice.